- CPC have not taken kindly to my opposition to the fencing/grazing project, and I have recently found out that they have been telling people that I ride "like a hooligan over the common, causing commoners' livestock to panic". I have also been told that they have received complaints by email from commoners concerned about the welfare of their animals and that I have been reported to the police. - I do not believe that commoners have complained about horse riders upsetting their stock for the simple reason that no commoners graze stock on the common and they haven't done for over 35 years ! I have spoken to the police who have confirmed that no complaints have actually been made about me, but I have logged a complaint about CPC so that there is a record that they have been lying about me. With regard to Chorleywood Common, I got involved when the grazing project first started several years ago. 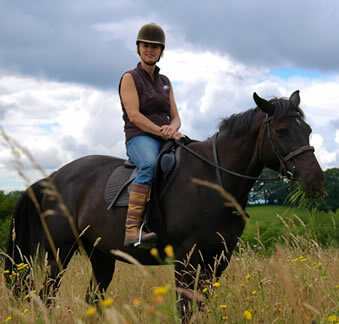 I'm a member of the Chess Valley Bridleways Assoc. committee, which was founded in 1973 following the death of a horse in a road traffic accident. It was suggested at first that the grazing enclosure would cover a much larger area of the common and horse riders would have to open/shut a gate to enter/leave the enclosure, very close to the railway track, which we didn't think would be safe as a train might speed past whilst you were trying to open or shut the gate and spook the horses. Chorleywood Parish Council and CMS appeared to be trying to suggest that the common was hardly ever ridden over. In fact, in a report produced by CMS it stated that the "horse track was hardly used". We have always felt that CPC would prefer that the common was not ridden over and we complained about this statement as it was untrue, and we were concerned that if such a statement was left in such a report unchallenged, it might effect riders rights later on. 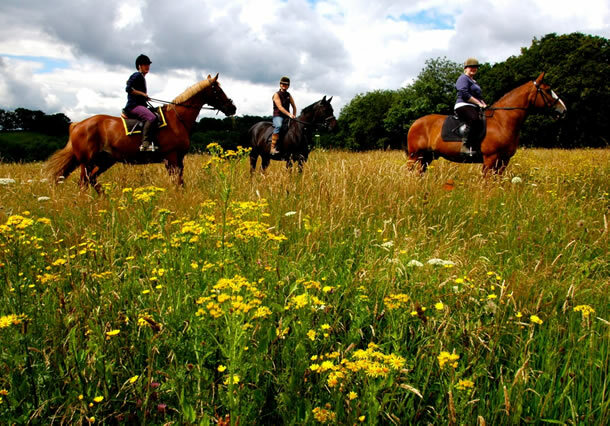 CPC state that there is a permissive horse track circling the common, however, we believe that riders have the right to ride over the whole of the common because it is an urban common and section193 of the 1925 Law of Property Act allows for such commons to be ridden over freely. 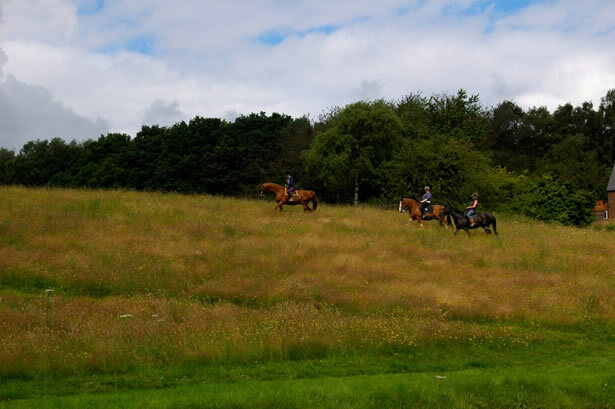 When CPC were making plans to fence Larks Meadow, we asked for horse friendly access gates to be provided, but CPC refused to agree to this as they do not accept that it is an urban common and therefore do not accept that riders have the right to ride all over the common. CPC erected 1.5km of fencing without planning permission and enclosed Larks Meadow. Pedestrian access was provided for but horse riders were excluded.. After complaints about the fencing they applied to DEFRA for retrospective permission, which got refused and CPC were faced with appealing against the decision or removing the fence. Not confident about winning an appeal, they decided to remove the fence, but because they still wanted to continue with the project, they realised that they could "get around" the issue about the planning permission by erecting the fence for a maximum of 6 months each year and removing it for the remaining 6 months each year. The new fence was due to be erected this Autumn, but we have now been told that it will not go ahead due to a legal issue that has arisen. It appears that DEFRA and CPC have a difference of opinion over CPC's understanding of the law, and it seems that the information received from DEFRA does not specifically relate to grazing, but may have wider implicatons. They are unable to clarify what the actual issue is at present, and we don't know whether it is the case that they will forget about the project altogether, or whether they will try and "get around" this problem as they did before, and continue with it at a later date. Unfortunately, CPC have not taken kindly to my opposition to the fencing/grazing project, and I have recently found out that they have been telling people that I ride "like a hooligan over the common, causing commoners' livestock to panic". I have also been told that they have received complaints by email from commoners concerned about the welfare of their animals and that I have been reported to the police. This is completely untrue. Firstly, I don't ever ride like a hooligan. The only time I ever ride fast is out hunting. I seldom go faster than a trot on the common as many of the dogs that you meet are not horse friendly, and the faster you go the more likely you are to be chased. Secondly, I do not believe that commoners have complained about horse riders upsetting their stock for the simple reason that no commoners graze stock on the common and they haven't done for over 35 years ! Have you suffered similar experience to Anne Pearson ? NATURE CONSERVANCY—CONSERVATION OF LANDSCAPE—TREES, SHRUBS, ARCHAEOLOGICAL REMAINS AND FEATURES OF HISTORIC INTERESTS—THE PROTECTION OF PUBLIC RIGHTS OF ACCESS TO ANY AREA OF LAND. SECTION 10 BYE-LAWS;-- TO MAKE AN ORDER OF PREVENTION OF NUSIANCE AND PRESERVATION OF ORDER ON THE COMMON. (ii) TO ANY LAND OVER WHICH THE COMMONABLE RIGHTS ARE OTHERWISE EXTINGUISHED IF THE COUNCIL OF THE COUNTY OR COUNTY BOROUGH IN WHICH THE LAND IS SITUATED BY RESOLUTION ASSENT TO ITS EXCLUSION FROM THE OPERATION OF THIS SECTION, AND THE RESOLUTION IS APPROVED BY THE MINISTER. (2) THE LORD OF THE MANOR OR OTHER PERSON ENTITLED TO THE SOIL OF ANY LAND SUBJECT TO RIGHTS OF COMMON MAY BY DEED, REVOCABLE OR IRREVOCABLE, DECLARE THAT THIS SECTION SHALL APPLY TO THE LAND, AND UPON SUCH DEED BEING DEPOSITED WITH THE MINISTER THE LAND SHALL, SO LONG AS THE DEED REMAINS OPERATIVE, BE LAND TO WHICH THIS SECTION APPLIES. (3) WHERE LIMITAIONS OR CONDITIONS ARE IMPOSED BY THE MINISTER UNDER THIS SECTION, THEY SHALL BE PUBLISHED BY SUCH PERSONS AND IN SUCH MANNER AS THE MINISTER MAY DIRECT. (4) ANY PERSON WHO, WITHOUT LAWFUL AUTHORITY, DRAWS OR DRIVES UPON ANY LAND TO WHICH THIS SECTION APPLIES ANY CARRIAGE,CART, CARAVAN TRUCK OR OTHER VEHICLE, OR CAMPS OR LIGHTS A FIRE THEREON, OR WHO FAILS TO OBSERVE ANY LIMITATIONS OR CONDITION IMPOSED BY THE MINISTER UNDER THIS SECTION IN RESPECT OF ANY SUCH LAND, SHALL LIABLE ON SUMMARY CONVICTION TO A FINE FOR EACH OFFENCE. (6) THIS SECTION DOES NOT APPLY TO ANY COMMON OR MANORIAL WASTE WHICH IS FOR THE TIME BEING HELD FOR NAVAL, MILITARY OR AIR FORCE PURPOSES AND IN RESPECT OF WHICH RIGHTS OF COMMON HAVE BEEN EXTINGUISHED OR CANNOT BE EXERCISED. SECTION 193 IS STILL IN TACT.